This police car door is one of many artifacts related to the events of September 11 at the New York Historical Society as part of the exhibition "9-11: One Year Later." Two months after 9/11, Robert Macdonald, the former director of the Museum of the City of New York, was asked how long it would take for the museum to put together an exhibition on the terrorist attacks. "The Smithsonian waited 35 years to present an exhibition of the Japanese internment," Macdonald said. "We are not going to wait 35 years to present the defining event in New York, but we are going to wait more than four or five months." This is not how it turned out. New Yorkers worked to make sure the events of September 11th would not be erased -- from their own memories, or from history. In the first weeks, color photocopies of the missing were plastered on bus shelters and lampposts. "Walls of prayers" and makeshift shrines and memorials sprang up throughout the city, many placed outside firehouses. And these creative acts had a profound influence on New York City museums. This 1973 photo is part of a Skyscraper Museum exhibition that was originally to be displayed at Windows on the World in October 2001. Photographs of many of these spontaneous displays are being presented in an exhibition entitled "Missing: Streetscape Of A City In Mourning" at the New-York Historical Society. "Here is New York" a collection of images from amateur and professional photographers opened in SoHo on September 25. By December 24, the exhibit had sold more than 30,000 prints of photographs to raise money for relief efforts. Many of the best photographs from "Here Is New York" became part of a slide show in "Life of The City," at the Museum of Modern Art. A year later, some 150 museums across the country are displaying 9/11 exhibits as part of a collaboration of participating in ``Celebrate America's Freedoms: A Day of Remembrance." The New York Historical Society is currently presenting seven exhibitions relating to the tragedy, including "In the Light of Memory," a painting of the 360 degree view that used to be visible from the top of the South Tower, "Pilgrimage," a photo essay documenting the faces of Ground Zero visitors in the weeks following the attacks, and "Twin Towers Remembered," a series of photographs of the World Trade Center taken over the last 31 years. "We are not the World Trade Center museum, but we do feel there is a strong public need to connect to the evidence of this event," said Jan Ramirez, vice president of the New York City Historical Society. With such shows, museums redefined what a museum exhibition means, erasing the line separating amateur from professional -- as if to say, "we are all in this together" (or, more pessimistically, "the professionals didn't know anything more than the rest of us") -- and rethinking the long-held belief that a museum exhibition takes years of preparation. It was almost as if New Yorkers reacted to the sudden destruction of something as "permanent" as the twin towers by seeing the city, and everything in it, as really just makeshift, temporary. A display of 60 panels made by artists from across the nation. Included are works in fiber, wood, glass, clay and metal. An exhibition of The Peacable Kingdom, a painting by Edward Hicks. January 12 & 13, January 19 & 20, and January 2527. A series of exhibitions, films and discussions on Americas cultural diversity in light of the September 11th tragedy. Also, an American flag found at Ground Zero will be on display through November in the Theodore Roosevelt Rotunda. An exhibition of Touhami Ennadres photographs documenting the trauma of September 11. A show of works created by children in the aftermath of September 11. Seven photographs by New York Post staff photographer G.N. Miller taken during the turmoil at ground zero on September 11. A presentation of artwork by students from the tristate area  a joint project of the Center for Arts Education and the Alliance for Young Artists and Writers. An exhibition featuring the artwork by children who have undergone post-September 11 therapy. An exhibition featuring paintings of James Gilroy reflecting the emotional aftermath of September 11. Sept. 11, 11 a.m.-1 p.m.
A session of doll-making to help children and adults heal after September 11. Sept. 11, 10 a.m.-4 p.m.
A display of drawings by local school children depicting New York City buildings and ideas for rebuilding the World Trade Center site. This exhibition of photographs taken by Flo Fox during the construction of World Trade Center. An exhibition of items found in the rubble of the World Trade Center and images captured by Staten Island photographers. A display of three projects related to the destruction of World Trade Center. A display of September 11 related monument, including beams from the World Trade Center. A display of etchings from Israeli artist Moshe Gershuni's Kaddish series, featuring the words from the Kaddish - Jewish prayer of personal loss. A display of "missing" posters wallpapered around the city in the days following the attacks. Sept. 11-Oct. 12, Tues.-Sat., 12-6 p.m.
An exhibition of gifts and sentiments presented to the Borough of Manhattan. An exhibit dedicated to women who managed to escape the burning Twin Towers, with shoes as the main theme. Women would take off their shoes to run faster, and that is why the participants were invited to draw a picture of shoes, write a poem about shoes, or create a shoes-related artwork of other kind. Sept. 10, 8 a.m.-8 p.m.
An exhibition of memorial quilts. An exhibition of the two chalkboards used by firefighters from the neighboring Engine Company 22 and Ladder Company 13, who were dispatched to the World Trade Center on Sept. 11. A display of artwork from permament collections selected by the courators of several museums. 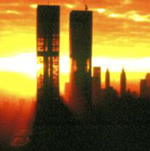 the collapse of the Twin Towers. An exhibition including a sampling of the nearly 19,000 of responses and ideas birth at the workshops held throughout the city in the months following the attacks on the World Trade Center. The art and photography of James Potorti, a business analyst who was killed on September 11. A presentation of a documentary about four Mexican immigrants who lost their lives in the World Trade Center tragedy. A presentation of programming that addressed the events of Sept. 11, including "The West Wing," "Sesame Street" and "America: A Tribute to the Heroes." An exhibition of Joel Meyerowitzs photography accompanied by clips of television coverage of Sept. 11 from around the world. Three-part listening series in the Radio Listening Room, featuring NPR's "The Sonic Memorial," Transom.org's "The Days That Follow" and "Teens and 9/11." September 11, 2002 - January 5, 2003. The Day Our World Changed: Children's Art of 9/11 is a joint project of the New York University Child Study Center and the Museum of the City of New York. It was created based on pieces of childrens artwork following the September 11 tragedy. A Community of Many Worlds: Arab Americans in New York City. March 2, 2002 - September 1, 2002. An exhibition portraying the struggles of Arab New Yorkers to fight the discrimination they are facing after September 11. An exhibition of photographs by Joel Meyerowitz. A virtual exhibition featuring poetry and images contributed by the general public. Just as Union Square was a place of sharing thoughts after the 9/11 tragedy, so is the web site designed to become a virtual place where people can express their feelings and post poetry and images regarding to the last years tragedy. Ongoing web project which provides a brief history of skyscrapers, the Port Authority, and the construction of the World Trade Center complex. A display of September 11th related materials, such as cards and letters of sympathy sent to the FDNY, patches and sentiments from firefighters around the world who have come by to show their solidarity, as well as Fire Department charts showing which fire companies responded and how many firefighters were lost in the disaster. A tribute to the 23 police officers who lost their lives in the September 11 attacks, featuring the artifacts from ground zero, photographs and items on loan from fallen officers' families. A quilt made by visitors to the Science and Air Space Museum in Oklahoma City and presented to the Hall as a symbol of support. Sentiments form Around the World  letters of codolence and sentiments sent by children from in the months following the attacks on the World Trade Center. A series of images taken by photojournalist Richard Press at the NYC Medical Examiners Office and Fresh Kills landfill in the months following September11. The exhibition portrays the efforts to find and identify victims of the World Trade Center disaster. A series of photographs of the World Trade Center over a period of 31 years beginning in 1970. A version of this exhibition was at the National Building Museum in Washington, D.C. November 2001  March 2002. A photo essay by Kevin Bubriski portraying the faces of thousands of people who came to the disaster site in the weeks following the tragedy. A series of images by Magnum agency photographers capturing the events of September 11 as well as the reactions of New Yorkers in the days immediately following the disaster. A demonstration of the infrastructure and its importance in the light of the World Trade Center disaster. Inspired by Dan Borunda of Simi Valley, California, who managed to collect signatures and sentiments of thanks and support for the New York emergency services workers on his cross-country tour. An exhibition portraying the lives of Mohawk ironworkers who helped in the construction of the World Trade Center. An exhibition of paintings by seven different artists. A display featuring 20 collages by artist John Digby and models and drawings by architect Mark Khidekel. An exhibition examining the consequences of traumatic violence in societies around the world. Photographs of port workers who assisted in the evacuation of people from lower Manhattan on September 11. Groundbreaking for Garden of Healing and Staten Island Firefighters Memorial Exhibit. An exhibition based on the September 11 tragedy and the responses of the residents of Staten Island. It includes photographs, artifacts, childrens artwork. A photographic and documentary exhibition featuring news coverage of the September 11 attacks from the Ukrainian-American press. A display of fifteen art quilts by Paula Nadelstern. A collection of "memory jars" relating to the tragedy of September 11. A display of photographs by Randi Barros. An exhibition of 85 life-size photographs of emergency workers, survivors and relatives of victims of the Sept. 11 attacks. "Ive been shooting through tears a lot. Ive heard countless stories of heroism, loss and recovery. There hasn't been a single bitter or angry word. The mood in the studio has been one of acceptance and healing. Anger has been absent," photographer Joe McNally told the Washington Post. The third exhibition in the series "Imaging the Future: The Intersection of Science, Technology, and Photography." The images portray the hours following the attacks. Drew Pisarra commented on the exhibition: "A couple of Flowers' originals look like black and white photos until it registers: Dust and smoke robbed the world of color in the aftermath." An exhibition of 27 images by award-winning photographer Joel Meyerowitz documenting the rescue efforts, recovery and the excavation at the World Trade Center sire. The presentation was also shown in galleries and museums, arranged by in cities all over the world. Lavin Ambreen Ahmed described the exhibition as "a moving experience," and stated that "the exhibit hits home the message that if terrorism can wreak such havoc in the United States, hate-crimes or violent attacks can strike anyplace, anywhere." Brotherhood: In Strength and Sorrow, Images of the FDNY. A collective effort of 69 photographers who documented the firehouses that lost members in the attacks on the World trade Center, showing the impact of the tragedy on their fellow firefighters. Drew Pisarra commented on the exhibition: "The formal setting and the increased image size work harmoniously to produce a visual eulogy that no coffee table tome can match. Not merely harkening to the WTC tragedy, these images remind you that the surviving firefighters continue to risk their lives everyday." December 1, 2001January 13, 2002. Exhibition space for the artists of the Lower Manhattan Cultural Council's Artist-in-Residence Program at the World Trade Center, many of whom lost their work in the Twin Towers collapse. This exhibition commemorating the World Trade Centers 30th anniversary originally planned to be presented by the Museum at Windows on the World at the top of the World Trade Center in fall 2001. The updated version of the exhibition was presented at the Skyscraper Museum in the Lower Manhattan. An exhibition portraying the impact of traumatic events on urban life in light of manmade and natural disasters that took places in cities around the world including Berlin, Germany; Beirut, Lebanon; Oklahoma City, USA; Kobe, Japan; and Manchester, England. An exhibition of artwork about New York City's history in the late 19th and early 20th centuries. It contains over a hundred images of famous New Yorkers, interesting sites and important events. Changed Lives: New Jersey Remembers September 11th, 2001. An exhibition containing personal objects, artwork, photographs and testimonies documenting New Jerseys response to the events of September 11. An exhibition portraying the rescue efforts of the emergency service workers and the recovery operation at the Staten Island Landfill. It also focuses on public response expressed at memorials held throughout the city. The exhibition contains objects, photographs and video images. An exhibition containing artifacts, images and personal stories that bear witness to the events of September 11. The display will have several sections, including photo gallery, video presentation produced by ABC News and object gallery. A ten-day exhibition of more than 140 photographs that chronicle the events of September 11, 2001. An exhibition by artists from New York, Beijing, and Illinois who express their reactions to the World Trade Center tragedy through their work.